Today, we go to doctors when we’re sick; when our body is broken and we need to feel better. In Ancient China, doctors were employed to keep patients healthy; if they got sick, the payment stopped, according to a book written around 200 BC. The ancients realised that prevention is better than a cure. Today, we’re just beginning to understand that. On World Cancer Day 2014, experts acknowledged that prevention has a crucial role to play in stemming the “tidal wave of cancer” that we are facing. Recently I’ve been asked to give a number of talks on cancer prevention and I thought I’d share with you one important area I’m covering – mushrooms. I consider them to be one of five food groups we should eat every day. I love button mushrooms on spelt sourdough – with a slug of balsamic and crushed garlic; I make a mean fish stir fry with shiitake mushrooms, snow peas and bean sprouts; and recently I’ve been treating myself to Natasha Corrett’s Wild Mushroom Quinoa Risotto from her new cookbook Honestly Healthy for Life. Supplements are a good option for those who ‘aren’t so mushroom’ as the French like to say when they’d rather not eat something. I can’t vouch for every medicinal mushroom product on the market, but there are two which Mum and I take and that I recommend to clients. Just to be clear I do not receive any financial benefit from naming these supplements – I simply believe in the integrity of the sellers and am impressed by the research. Please do feel free to leave your own suggestions in the comments section at the bottom of this post. 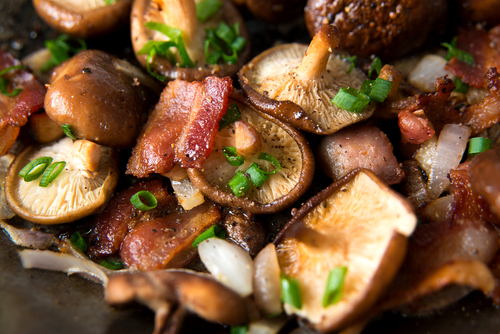 Mushrooms contain beta-glucans, which stimulate our immune system to detect and destroy tumour cells. Shiitake: You’ll get a nice boost of vitamin D3 AND a dose of a powerful anticancer compound called AHCC (active hexose correlated compound). What to do with them: Buy a packet of dried shiitake mushrooms, soak them for twenty minutes in warm water and add them to stir-fries, miso soup or sauté them with some Tamari sauce and serve with a grass-fed steak. 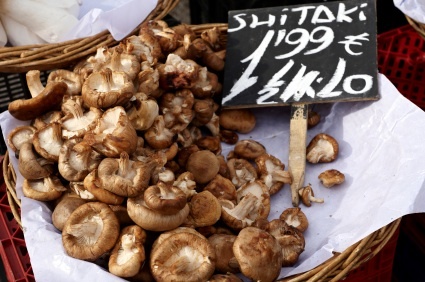 The Research: Shiitake mushrooms have been shown to help people with liver cancer live longer and now new research shows they may also help prevent cervical cancer and keep it from coming back. The latter finding was revealed at the annual Gynecological Oncology meeting in Florida this year. Reishi: The tough woody texture means Reishi mushrooms aren’t ideal for eating – but they are packed with medicinal value. Referred to as the ‘mushroom of immortality’ the ancient Chinese used Reishi to sharpen memory, improve mood and to boost longevity and youthfulness. Today we also know Reishi mushrooms stimulate the production of glutathione (known as the mother of all antioxidants) have powerful anti-cancer, anti-tumour abilities and might even help with diabetes, herpes and HIV. What to do with them: Try Reishi Spores or Reishi Triterpene Crystals. Triterpenes are the most potent ingredient within Reishi spores, so by taking this concentrated extract you’re really reaping the benefits according to extensive research by raw food guru Matt Monarch. You can read more here. Once again let me emphasize that I do not receive any kickbacks from Matt Monarch. I simply believe in his message and the quality of products he promotes. Mum recently purchased the Triterpene crystals and they were shipped to Australia within four days. She has been having a quarter of a teaspoon of the powder, mixed with a glass of water, and although ‘it tastes pretty revolting’ she’s persisting. Read the research to find out why…. There are plethora of studies attesting to the benefits of Reishi spores and Reishi Triterpenes – but I won’t spore you with them all. Here are just a few. Liver and Bone Cancer: A 2002 study from China found that a form of Reishi spores inhibited tumours by 80-90%. Breast Cancer: In a 2012 study Triterpene crystals were found to inhibit cell proliferation in human breast cancer cells. In Malaysia, clinical trials have shown Reishi can help fight cancer and reduce the harmful side effects of radiation therapy. Diabetes: Reishi extracts were shown to lower the blood glucose levels of the mice within a single week (Phytomedicine, May 2009). Kidney Support: Those with diabetic kidney disease exhibited noticeably reduced markers of kidney stress, as well as lowered triglyceride and blood sugar levels following an eight week trial conducted by Peking University (Journal of Asian Natural Products Research, December 2006). Herpes: Triterpenes showed potent inhibitory effects on Epstein Barr Virus ( a type of Herpes virus) early antigen. HIV: Triterpenoids isolated from Reishi spores showed significantly anti-HIV activities (North American Journal of Medicinal Sciences, 2011). Maitake: for weight loss. In one Japanese study the fluffy, fan shaped mushroom – with a chicken like flavor- helped 30 overweight patients lose a significant amount over two months (between 11-26 pounds). Agaricus Blazei: for a serious immune boost. In one study it increased natural killer cell activity and quality of life in those with gynecological cancer. Lion’s Mane: to improve cognitive health. I dispense thirty drops under the tongue, twice a day before a tea-break. I wouldn’t say it’s deeply enjoyable but I feel it’s doing me good. 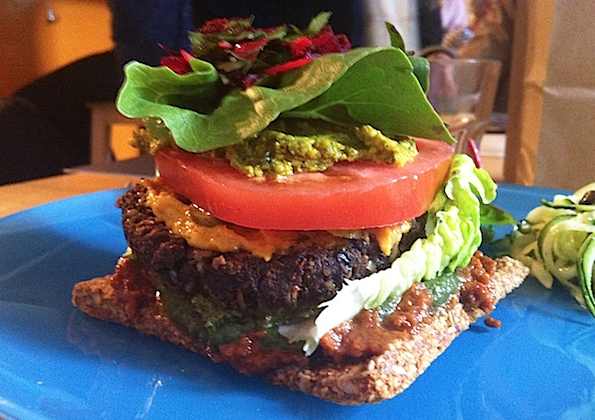 For a more indulgent mushroom experience I head to the Wild Food Cafe in Covent Garden for their Wild Burger with shiitake, raw olives, baba ganoush and more. I go there with one of my favourite people, Jacqui Marson, author of The Curse of Lovely, who sees clients nearby. We natter away over superfood salads and cacao smoothies and we tend to walk away with big smiles (and sesame seeds in our teeth). Of course nutrition is wonderful, but a good laugh is really the ultimate stress defence. Laura, what a wonderful blog! You are so spot-on, and I wish more people understood the value of mushrooms. David Wolfe, the well-known raw food enthusiast (amongst other things) has always referred to mushrooms is being extremely high in “ormus”. I’m sure you’ll enjoy watching this short, slightly animated video on how he says they are so special. I have a friend in Wales, Richard Edwards, whose extremely knowledgeable about mushrooms and their potential impact on ill health, and maintaining good health. Sadly, the government aren’t interested in taking up his ideas with regard to TB in cattle, for one example. There is much to be learnt on his website! 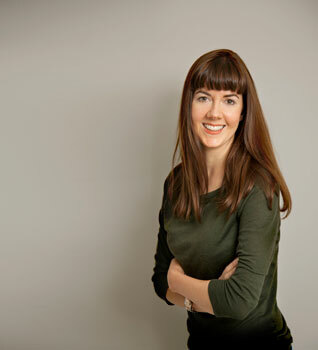 I am working with Integrative Medical Practitioner Dr Kate James. 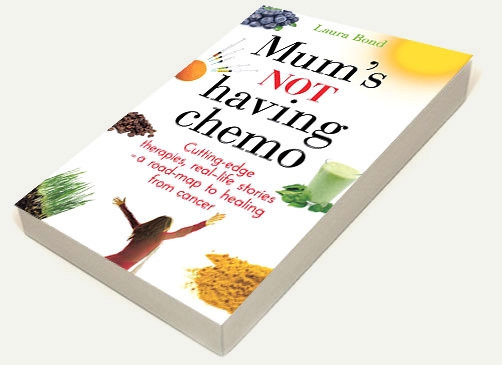 She uses the best of Eastern approaches to diet and supplementation to support people going through conventional treatment. She has got me taking Reishi, Coriolus and Cordyceps as well as Astragalus and lots of high chlorophyll based supplements. Certainly feeling well on it! I am due to start chemo in a couple of week’s time and am looking forward to a relatively side effect free experience ! Just found this interesting article about actually boosting the levels of vitamin D in the mushrooms themselves! Guess how you do it? Put them in the sun, of course! Thanks James! This is fascinating.